19.07.2016. 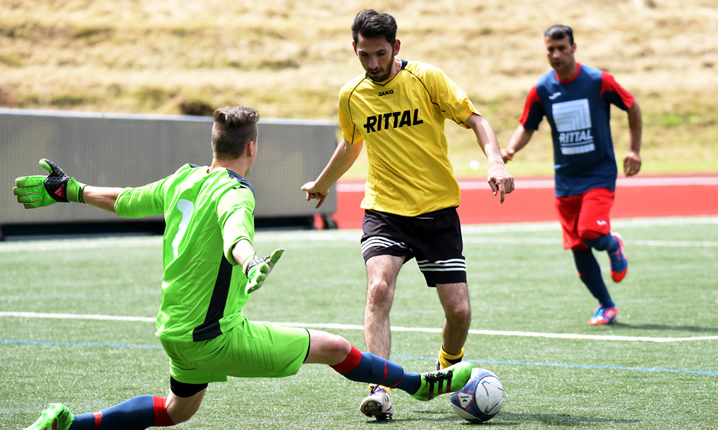 On a sunny summer day and in almost 30°C heat, more than 200 Friedhelm Loh Group employees – from Germany and further afield – gathered for the Rittal Cup football tournament at the Burbach Stadium in Ewersbach in central Hesse. Participants were not just competing for a trophy, but also raising funds for a good cause. And their efforts underlined that whether at the workplace or on the pitch, they are very much team players. 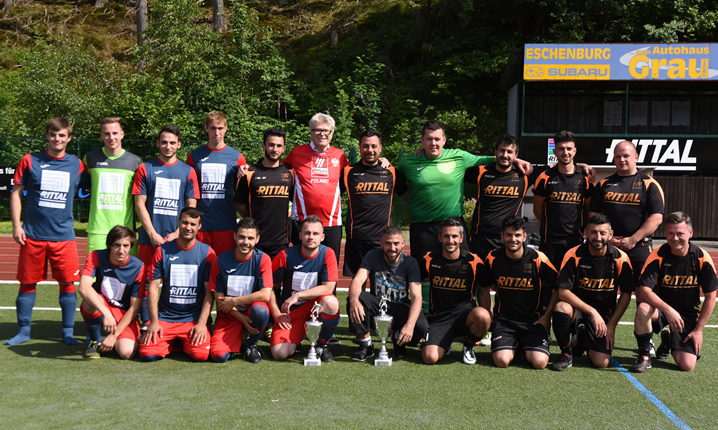 Few tournaments entail so many games in a single day as the Rittal Cup: it took 56 matches to determine this year’s winner, with the first games kicking off early in the morning. A total of eighteen teams, representing many companies in the Friedrich Loh Group, entertained spectators with their skills. 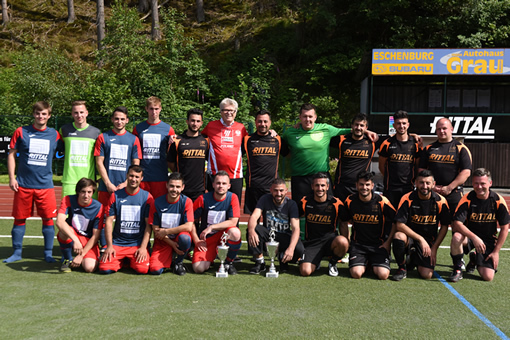 Squads from Poland and Czechia, and from the German towns of Rittershausen, Burbach and Monheim am Rhein, gathered to play the beautiful game. Team spirit was high as each sought to prove their mettle on the field. Matches were fiercely competitive, from the very first qualifying rounds right through to the tournament’s conclusion. As the clock ran out on the final, the score was still 0-0. Onlookers were on the edges of their seats as the winners were decided by a penalty shoot-out. In the end, the Rittershausen players narrowly outperformed a team of apprentices from Wissenbach. With a score of 4:3, the victors proved that neither technique nor tactics can triumph over team spirit. Third place went to the team from the plant in Burbach. Their number included Salmi Alshiki, who attracted considerable attention and applause with his football feats, and was named player of the tournament. 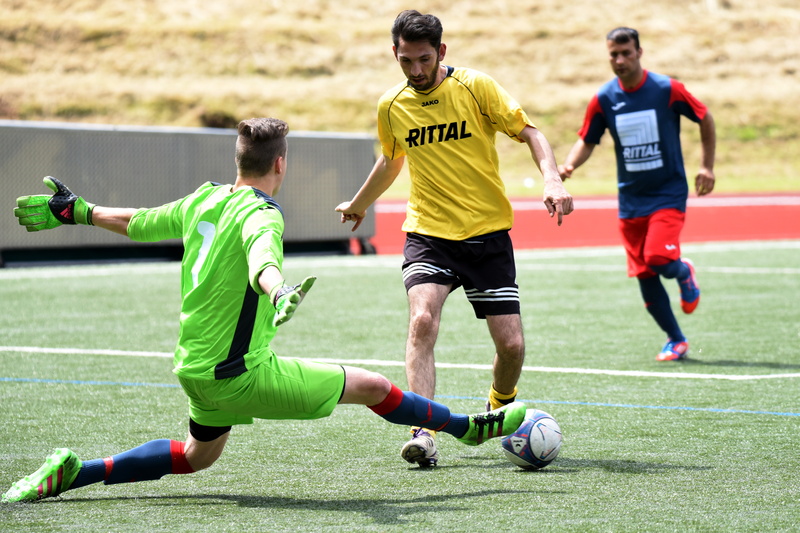 And even though his team did not win the title, Aykut Babayigit, an employee of RGS in Wissenbach, was top scorer, hitting the back of the net on ten occasions. At the awards ceremony, Dr. Friedhelm Loh, company owner and CEO, expressed his pleasure at how the day went: “We have seen good teams playing great games in a spirit of fairness and sportsmanship. I am very proud of my staff – every one of them has shown that they live by the values of our Group, both at work and at play.” He emphasized that dedication and enthusiasm are as important on the job as they are on the pitch for reaching one’s goals – both as a team and as an individual. As is tradition, the tournament for teams drawn from the Friedhelm Loh Group is an event for the whole family. There was plenty to do for those who were not watching from the stands or cheering from the touchline. Attendees could sample treats from a sizzling barbecue or enjoy refreshing drinks. There was even a champagne bar under a pavilion. The lucky winner of a raffle was awarded a trip to one of the Friedhelm Loh Group’s European locations. There was also a fun fair, with a merry-go-round, a bouncy castle, pony rides, a goal-shooting competition, and a GPS-guided geocaching hunt for teenagers. In addition to being entertaining, these activities generated money for a good cause. Since the Rittal Cup was first launched in 1992, all proceeds from the tournament have been donated to a local not-for-profit organisation. In total, more than 50,000 euros have been raised. The honour of hosting the event went to Rittershausen this year. They won the cup in 2015, and it is traditional that the victors hold the tournament in the subsequent year. It was expertly coordinated by Norbert Peter, assisted by Susanne Schäfer and Angela Patz. Local sports club SG Dietzhölztal helped with planning and organisation, commencing their efforts many months in advance. Image 1: Dr. Friedhelm Loh was full of praise, and not just for the winners of the Rittal Cup 2016. An exciting final culminated in a penalty shoot-out, with the team from Rittershausen (right) emerging victorious against the apprentices from Wissensbach (left). Image 2: This year’s Rittal Cup comprised 56 closely contested games. There were 18 teams and a total of more than 200 players, drawn from Germany and international subsidiaries of the Friedhelm Loh Group.